I think Riley is so cute. I coloured Riley with my water colour pencils and his motorcycle with my at you Spica glitter markers it does not really display the sparkle in this image. 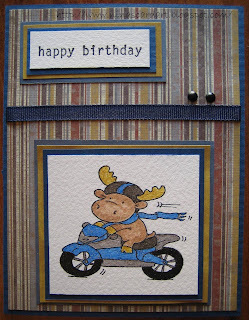 Supplies: Dark and light blue cardstock, Memory Skor – Designer paper, Motorcycle Riley – Hanna Stamps, Stampin’ Up! – Birthday Whimsy, misc ribbon and brads. This is an Easter card for my in-laws, I think these little bunnies are so cute. 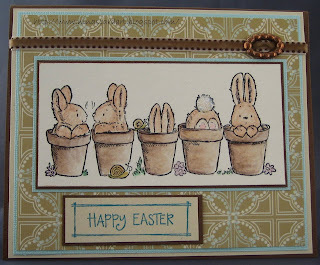 Supplies: Brown, teal and cream cardstock, Designer paper – Unknown, Penny Black – Bunny Friends, Katie & Co – Happy Easter, Dashes, Dots & Checks ribbon, misc ribbon slide, glitter. I made the cutiest card last night for the in-laws for Easter, not going to show you though because I have not take a picture. I do have another one though to show though. I started this card so I could enter it in a contect at the local stamp store. The problem with this card although not really visablewith the image, is that I outlined all the edges with very fine glitter in gold with a Just Glitter pen from deco. If I had stuck to just outlining the watercolour paper it would be fine, the rest was just a little too much. I remade the card a second time but I did not like how I coloured the image with my watercolour pencils. My adhesive is too good to allow me to swap them out. Lesson learned. 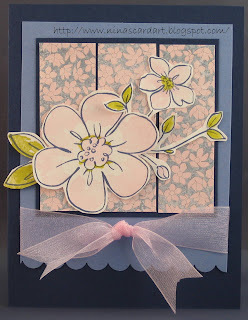 With this fourth card from the workshop I went way outside of the template that was displayed. The orginal card was a calendar card for the month of April. 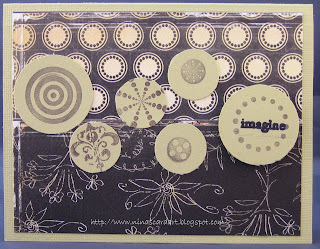 I asked instead if I could use a different stamp.. and a couple of addition pieces of cardstock... and a button. I though this was a very pretty flower and I was happy with the way the card turned out. All Supples from Stampin' Up! with the exception of the ribbon which is from a dollar store. 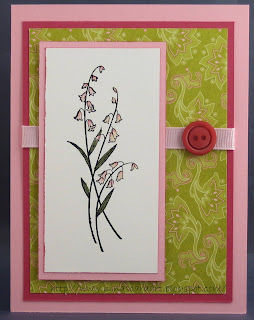 This is the third card that was made this weekend at the Stampin'Up! workshop I attended. I wanted to use my water colour pencils for the details. 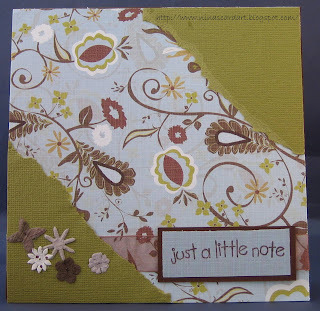 All supplies used for this card are Stampin' Up!. I am a bad blog follower, I love to quickly visit the blogs I finds interesting. When I do this it is usually when I sneak 5 min here and there to peak, I rarely have the time to focus and leave a comment. I really need to try to fix that. This is an on the fly post. My husband had a middle of the night call from work last night, I have control of the phone so on the way to answering it I must have turned off my alarm. So I was a little late on my start this morning, so I did not get my blog done. So I am home for lunch and though I would do a quick post. 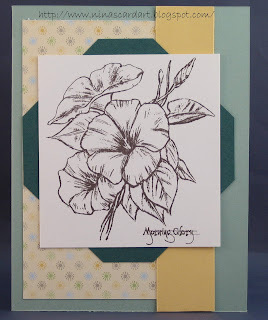 This is another card from this past weekend's Stampin' Up! workshop. All supples from Stampin' Up! with the exception of the ribbon. That I believe is from Michael's. I did get the chance to make some cards this weekend, both on my own and at the Stampin' Up workshop I attended yesterday. 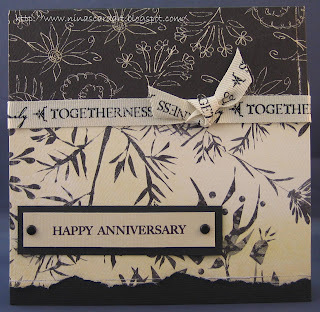 I am going to start this week with posting the Stampin' Up cards. I was feeling a little off kilter at the workshop as it was a little crowed and I kept banging my arm on a cup holder/recycle bag hanger that was attached to the table. This card is a tri-fold card that is held closed where that round button-like tab is. I did not think to write down all the supplies until the end of the workshop so I decided that I wouldn't. All the supplies are Stampin'Up anyway. 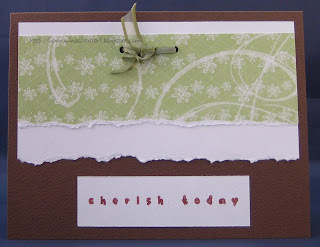 Another card class post today, I like this card although the 'Cherish Today' was stamped a little heavy. Don't try to fix what is not broken.... I see all the blogs I follow changing looks often so I though "Let me play". Not such a good idea, I have parts on my blog where I don't know what they are and where I can deleted them and I lost the list to all the blogs I visit all the time. I found some of them but not all. I am definately not the best at commenting on blogs but I do visit my little list all the time. *Sigh* Note to self, don't mess with it. Congratulations Samantha and Corey on the birth of your son Ethan. Barry and Judy you must be very excited to have a new Grandson. 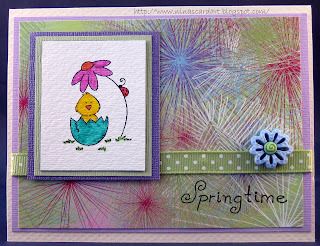 Another Easter card, this one I wanted to try some Flower Soft for the bunny tail, the jury is still out on that one for the results. I love the carrot stamp though. I also maxed out on glitter all over little Mr. Bunny but overall it turned out just fine. 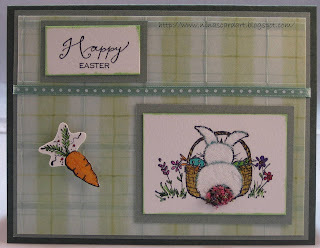 Supplies: Green cardstock, Aqua small Plaid Printer Embossed – Designer paper, Great Impressions – Bunny & Basket, Penny Black – Happy Easter, Great Impressions- Carrot, misc ribbon, Heather Flower Soft, glitter. This card will almost look like a re-run. If you look closely I used different stamps. 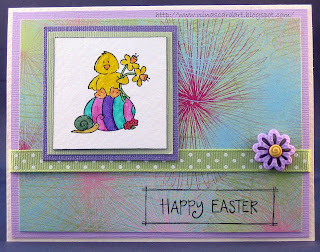 Supples: Cream textured, green and purple cardstock, Basic Grey Euphoria Designer paper, Elzybells Art Stamps - Easter Chick, Katie & Co - Happy Easter, Jesse James - Pastel Posies buttons, dashes, Dots and Checks ribbon. Happy St Patrick's day, are you wearing green today? I am guessing that this card was created in the same class as yesterday. I wonder how she came to that conclusion you say.. 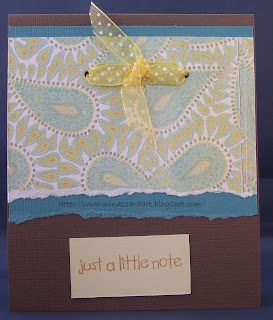 I think it is the 'Just a little note' message and the pasley paper it must have been a theme. This card has lots of green in it so I thouhg it would be a good one for today's post. Wishing you the luck of the Irish today. Monday morning... darn I am tired. I did not get much done in the way of cards this weekend so I am going to pull from my store of cards I made in classes. Again, no posting of supplies for these cards. Just a little bit askew on the 'Just a little note', the glue is well aged though and would chew up the paper pretty good if I tried to fix it. I really like the simplicity of this card though. Mornin' I was a bad last night and stayed up till about 11:30 reading a book. How I did that I have no idea as I was exhausted when I got home from work. Vogue 'the cat' woke me up 7 this morning, I dragged her close for a cuddle to try to fall back to sleep. The damage was done though and I was awake. It did not help that she decided she was going to sit on my pillow and just stare at me, it is down right creepy when see does that. I was not happy with my first attempt at Easter cards so this is my second. (Sorry Valinda I am not very good with the Spiritual stuff, I leave that to Barb). Supples: Cream textured, green and purple cardstock, Basic Grey Euphoria Designer paper, Elzybells Art Stamps - Daisy Canopy, Magenta - Springtime, Jesse James - Pastel Posies buttons, dashes, Dots and Checks ribbon. I am off to clean the house, have a great Saturday. I would love to say TGIF, but I am going to be working late tonight, I am on-call and possibly working tomorrow and I know I am working Sunday. I expect Monday to be a nightmare day so I will count down to next weekend instead. 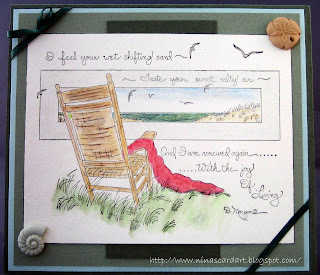 I was suppose to attend a Stampin' Up workshop this weekend but I will need to miss that. I was looking forward to it. I made this card the other night, I did a really quick card portrait so the image is not a bright as if I had set up the light tent. 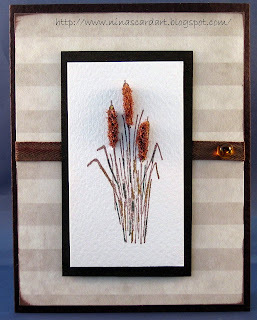 I did some more Bullrushes with Flower Soft. Supplies: Blue and blue metallic cardstock, Designer Paper – ColorBok Scrap Pack(Neutral), Impression Obsession – Boat Corner, misc ribbon buckle, Must Be Sold-BY-Spool blue ribbon, Flower Soft-Nut Brown. Until tomorrow - play nice in the sandbox. 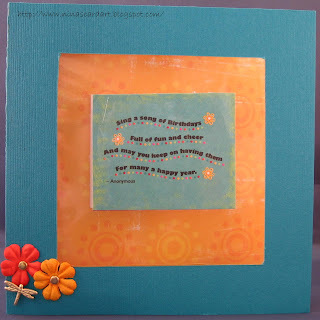 Welcome Thursday - I love this card. 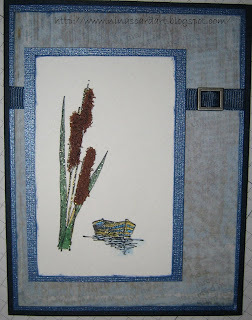 After the demo I attended last week on how to use Flower Soft I wanted to try it on these bullrushes right away. I really like the way it turned out. This portrait does not show it but there is glitter in the bullrushes to fill in any white spots and adds a nice touch. Morning, I made this card as a retirement card. I was exploring my watercolor pencils with this one as well. I think it turned out just fine. Supplies: Green Bazzill Basic cardstock, watercolor paper, stamps Happen Inc - Beach Chair, Jesse James - Dress me up buttons, misc ribbon, diamond glaze. 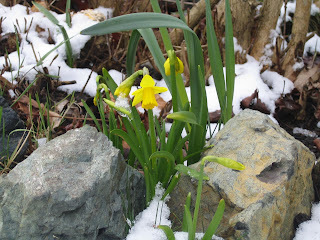 It snowed here in Victoria the other day... my poor little garden was all ramped up for spring, the flowers don't seem to mind though. Another masculine card today, I love Riley he is such a cute little moose. I went a little crazy and brought about 6 stamps of him so he will make a re-appearance. 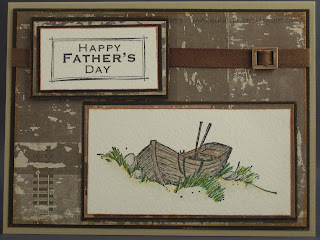 I used my water color pencils to color the stamped image, I used a large lure stamp to make my own designer paper of sorts to continue with the fishing theme then I finished most of my paper edges with my gold Deco Just Glitter pen. 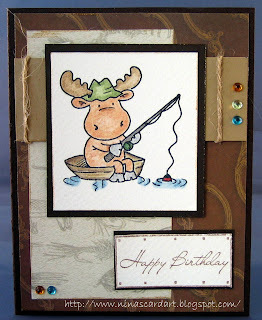 Supplies: brown, tan and natural cardstock, Designer paper – Memory Skor, watercolor paper, Hanna Stamps – Fishing Riley, Magenta- Happy Birthday, Judikins – Lure Background, twine, K&Company Gem Adhesives. I finally got around to taking some card portraits this weekend. I even managed a card or two. When I saw this stamp I loved it, problem being that it was in the back room of a stamp store where the classes and demos take place. When I asked about it I was offered the chance to buy it, umm yup, I could not resist that. I did promise to take a card in to show how I used it though. This was my first true water color card not just coloring some small section mind you, I still like my Blender pen best when using my watercolor pencils rather then a paint brush. I love making masculine cards, not sure why but I do so I really enjoyed making this one. 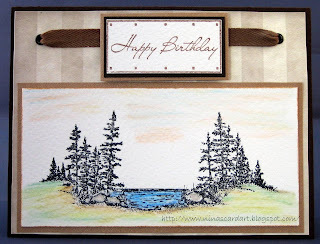 I used Diamond Glaze of the water in the bay to add dimension and gloss and Happy Birthday is popped up over the twill tape to give it the 3D effect. Supplies: Dark brown and tan cardstock, Imaginisce – Now and Forever Roman Columns Designer Paper, Rubberstamp Ave – Scenic Beach, Magenta – Happy Birthday, Scenic Route Paper Co. Twill Tape, Black eyelets, double sided dimentional tape, Diamond Glaze. I was lucky enough to have a good chunk of Saturday to myself and I was so excited to spend a good amount of it in demos at a local stamp store. After the demos I wanted to try what I learned at home and I will try to post some of those cards this week. 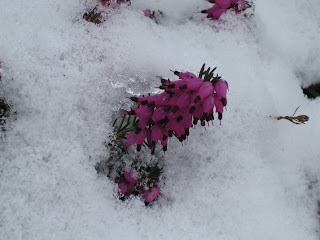 Happy Saturday, it is a beautiful sunny day here and yesterday there was rumor that we were going to have rain and snow. I am not complaining though. One of the local scrapbook stores makes up a card kit every month, I liked this stamp so I brought the kit. This was a very basic card to make. 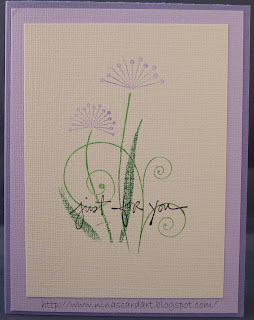 Supplies: Purple, violet and cream Bazzill card stock, Hero Arts - Two flourish flowers and For you. 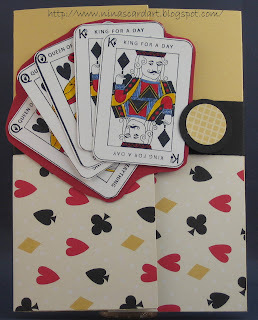 This was a very interesting card to make, although a little on the difficult side. The clear window was hard to align properly. It turn out ok in the end though. The orange that is displayed is actually the inside of the card. Behind the centre piece is and insert same size allowing some space to write. My favorite part is the flowers and the dragon fly brad though. 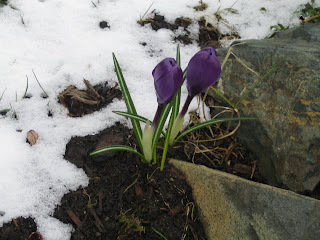 Spring is getting closer, I have daff's and crocuses making a good start in my garden. Victoria's flower count is only a week or so away. I don't think this class had an actual theme. I do like the distresses papers though. Have a great day. I don't recall if this was the last in the Asian theme Designer paper series class or not, I think it could be. I love this paper and I never did find it to be able to buy some. I still have not taken a picture if the cards I did this past weekend, I actually forgot about them till I was sitting and typing this entry. 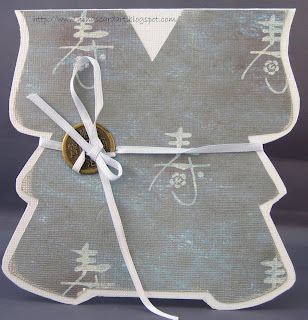 This is the fouth card from the Asian themed designer paper class, I love this idea. The card opens at the top. The only flaw that I saw was that when you untie the ribbon to open the card the coin comes off and it is not very easy to tie back up. I think I would want to work on that aspect a little if I ever try to recreate this card.